On the eve of COP24 in Poland, the alarming implications of the latest IPCC report “Global Warming of 1.5 C” recall the role of artists in thinking long-term about the future of the human species on this planet, alongside a new surge of scientist-led activism. In an interesting experiment by social scientists called the “bystander effect”, volunteer subjects are placed in a closed room and told not to leave the room under any circumstance. Then the room is filled with smoke. Unknown to the subjects, also planted in the room are “confederates”, actors who are briefed to stay where they are regardless and not panic. Researchers found that the subjects stayed where they were despite the risk of fire, although in a control group with no “confederates”, the subjects left the room. Some climate scientists find this experiment to be an interesting parallel to the current climate emergency: nobody is running from the room to put out the fire. The 1.5 degrees target was first set at COP15 in Copenhagen, which stalled at such an ambitious target, only to be replaced by far more modest targets set at COP21 in Paris in 2015. Now it’s back. In the IPCC report simply entitled “Global Warming of 1.5 C”, released in October 2018 and compiled by 91 scientists from 40 countries, the bombshell is dropped: unless we keep to the original 1.5 degrees, the planet will probably be uninhabitable by humans within the lifetime of our grandchildren. The problem with the IPCC reports is that they are very difficult to untangle from the “consensus” demanded by funders. But this one pulls no punches. It is clear that we have to decarbonize now, not tomorrow. In the face of this, Donald Trump, Jair Bolsonaro and others are ripping up even the modest Paris Agreement. 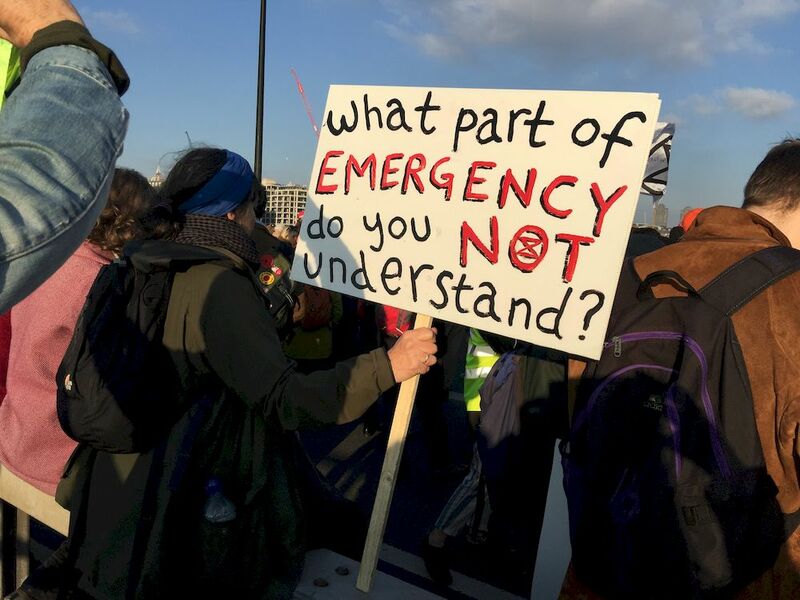 The climate emergency is here, now, and we are still in denial about it. 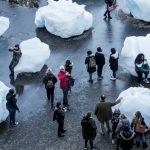 Scientists are meeting again at COP24 in December 2018, and the new climate emergency will likely be on the agenda. A forest has been created by Katie Paterson in Future Library. In 2014, the artist planted 1000 trees outside Oslo in Norway, which in 100 years will be fully grown and will then provide the paper for 100 books, commissioned once a year. Paterson is well known for her “moonbounce” work Earth-Moon-Earth, which bounced Beethoven’s Moonlight Sonata off the moon in a DIY radio transmission. There are a number of other “long” artworks that are designed to last thousands of years: John Cage’s As Slow As Possible, Jem Finer’s Longplayer and, of course, the Clock of the Long Now. 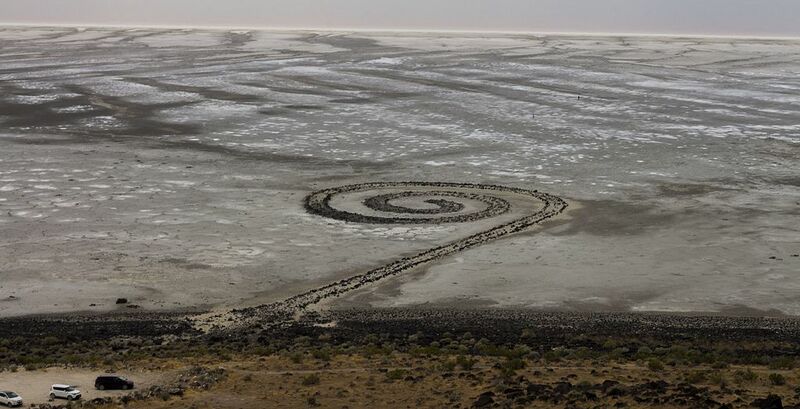 There are also major earthworks which would last longer than humans, notably James Turrell’s Roden Crater and Robert Smithson’s Spiral Jetty, which is already being affected by global warming and is changing day by day, year by year. But maybe the most effective art is activism. 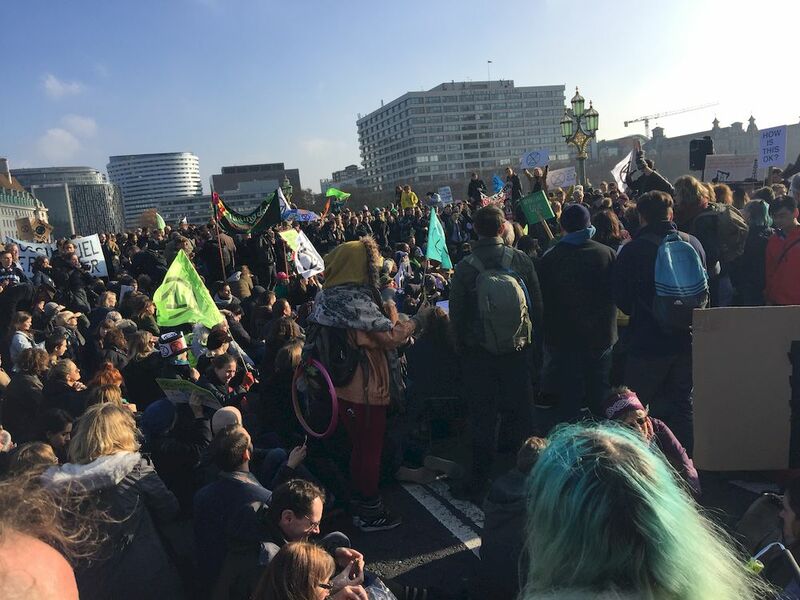 The new radical non-violent movement Extinction Rebellion have pledged to undertake immediate non-violent action against governments and the fossil-fuel industry. They made headlines by occupying Greenpeace headquarters, demanding that they “up their game”. This month they blocked five of London’s bridges and intend to continue with actions that will inevitably get them arrested. 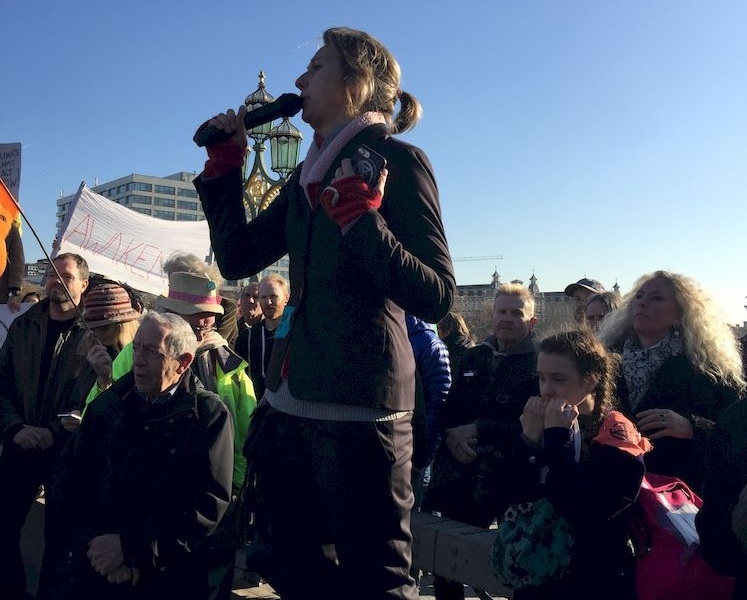 Another voice behind Extinction Rebellion is academic and Rising Up activist Roger Hallam. “We will go to London and block transport and government infrastructure. We will be arrested. Once released, we will do it again. After years of denial, we finally have to accept the terrible truth—those in authority are going to kill us—the infliction of unimaginable suffering on billions of innocent people. This is what is planned—openly and willfully. There is no greater crime. So the time for facts and figures is over, the talks that lead to more talks. 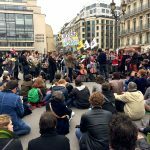 We are adults and no longer children.” At the next COP24 in Poland in December, Extinction Rebellion and non-violent resistance will almost certainly be on the agenda.